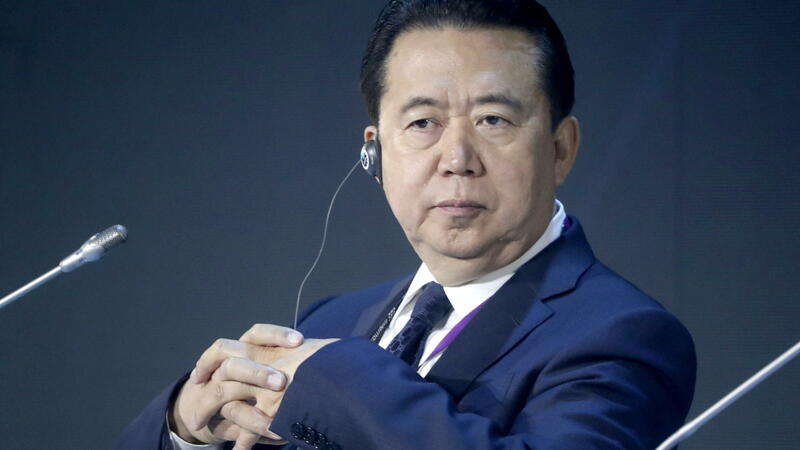 Interpol says President Meng Hongwei resigned on Sunday. Chinese authorities say they're investigating him as part of an anti-corruption campaign. Interpol said Meng resigned his post on Sunday, "with immediate effect." On the same day, his wife, Grace, told journalists in Lyon — where Interpol is based — that she had received a troubling text message from her husband's phone: a knife emoji. That was an ominous follow-up to an earlier message, which had asked her to wait for Meng to call. China's Public Security Minister Zhao Kezhi said on Monday that Meng is being investigated for allegations of bribery — charges that he did not describe in detail. Zhao said his ministry supports the inquiry; he also spoke of the importance of loyalty to the Communist Party's ideals. "We should deeply recognize the serious damage that Meng Hongwei's bribe-taking and suspected violations of the law have caused the party and the cause of public security and deeply learn from this lesson," Zhao said, in a translation by The Associated Press. The extraordinary case has sparked headlines around the world. It also prompted Interpol, the world's largest police organization, to ask China for an explanation. On Saturday, Interpol said Secretary General Jürgen Stock had sent an official request to China, hoping to clarify the legal status of its president. One day later, Interpol said it had received Meng's resignation letter — cutting his four-year term in half. "Observers in China say the fact that Beijing is willing to jeopardize its diplomatic relations by detaining Meng in this way suggests the stakes are high," NPR's Rob Schmitz reported from Shanghai. "Meng was appointed vice minister of China's national police by Zhou Yongkang, China's former security czar who was imprisoned after Xi Jinping became leader of China." When Zhao announced the bribery case on Monday, he said Zhou had left a poisonous influence in the ministry — one that needed to be cleaned out. Zhou was sentenced to life in prison in 2015, after pleading guilty to taking bribes and leaking state secrets. While he served as the president of Interpol, Meng maintained his role as China's vice minister of public security — a job he no longer has, according to the ministry's online leadership roster. Meng's biography page, which had previously listed his experience leading China's counterterrorism office, has also been scrubbed from the website. Meng was reported missing roughly a week after he left for a trip to China from Lyon where he and his family have lived since 2016, when Meng became the first Chinese president of Interpol. The case quickly raised suspicions that Meng might be under investigation, particularly after it was found that Meng had been tossed out of the Public Security Ministry's Communist Party Committee — an important role he had held earlier this year. With Meng's resignation, Interpol will be headed by South Korea's Kim Jong Yang, who will act as president until a new election can be held next month. The organization says that while the presidency focuses on global priorities, its day-to-day operations are overseen by Stock, its secretary general. Interpol has 192 member nations; the organization allows police agencies to collaborate and share resources through a network of national bureaus. It's slated to hold its annual general assembly session in Dubai, from Nov, 18-21.